What a great day! 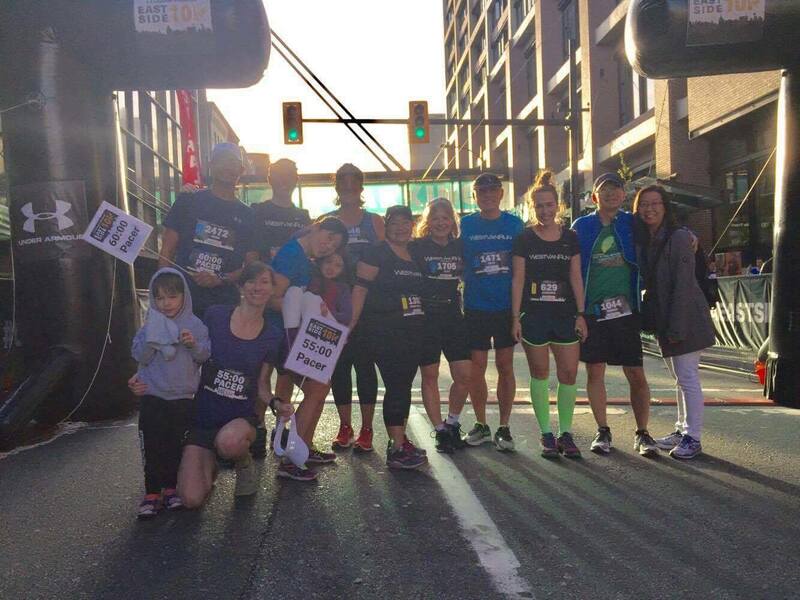 The Eastside 10K has been a favourite race of mine since it's inauguration because it takes place on my "birthday weekend". Last year it fell on my actual birthday, on an extremely rainy day. And this year, a bright and sunny race day, happened to be the day before my 37th birthday. 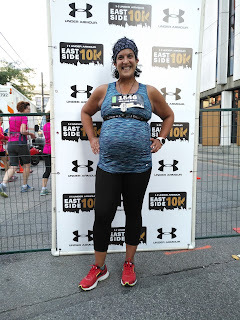 But participating this year was never something I was certain of, knowing that 10K is quite a distance and I would be 35 weeks pregnant on race day. 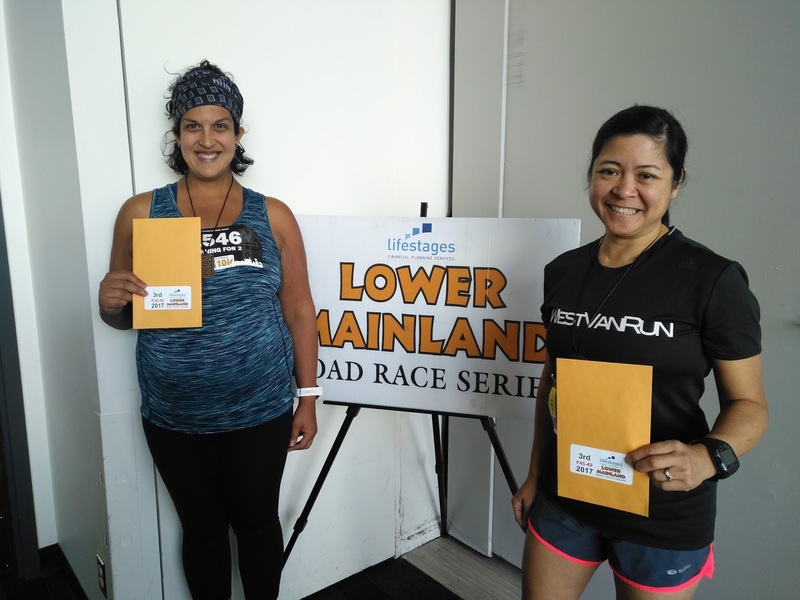 The Eastside 10K was also the final race of the Lower Mainland Road Race Series. I believe I've received awards now for 4 years straight in the series, but I had assumed it would be out of reach this year since pregnancy has slowed me down considerably. 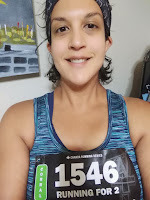 When I realized that I stood a chance to qualify, as long as I got my 5 races in, I seriously contemplated registering for this race to get me race #5. The normal Zahida would have registered long ago, but I wasn't sure it was sensible to run the risk of pushing myself too hard, or sign up for something I wasn't fit to do. I waited a little too long to decide what to do though and the race sold out! I had been running consistently and at the point where I realized it was sold out, I had absolute confidence in my ability to finish. Luckily a bit of spamming running groups on Facebook yielded in an injured runner willing to sell and transfer her registration to me right before the deadline to do so! Yes! The week of the race was a bit rough for me and left me feeling a bit of nervousness going in. I've been dealing with ankle and foot swelling by midday so I'm limited to running now in the mornings. I've also been dealing with terrible insomnia, so running in the morning before work is also not desirable. My first priority is self-care, not my races, so I choose sleep over training when I can. So I hadn't run since a week before the race, and the week had me feeling sluggish and sleepy. I had a very rough sleep on Friday night too, so waking up unrefreshed wasn't helpful at all for my confidence. Attempting to perk myself up with a morning coffee. But it didn't seem to matter. Everything on race morning was perfect! I felt uplifted by the nice weather and by the community around me. Physically I felt OK too, as if my dozen bathroom trips in the night rid me of excess water retention. I didn't feel like a heavy pregnant lady like I often do late in the day. So should I thank my baby for jumping on my bladder all night? Maybe? I arrived to the race site shortly before 8am to find the porto-potties and already started bumping into running friends. I met up with the West Van Run Crew for a group photo and then spent some time on my own mentally reviewing my race plan. Hidden in poor lighting, but still a great photo of the WVR Crew! Yes, I came up with a race plan for the day. I do this no matter what, so I have something to hold myself accountable to, so I have a method for reaching my goal, and to ensure I push myself just the right amount. Today it was really important to follow the plan because 10K is further than I have gone in a long time. I have been running 5-6km consistently my entire pregnancy, but my last run that was longer than that was about a month ago. 10km is a stretch considering, but I also know that after every 5km run I do, I always have gas left in the tank and I end up walking a fair bit on those days without being phased. The difference here is doing all those kms all at once, rather than running in the morning and walking in the afternoon/evening. 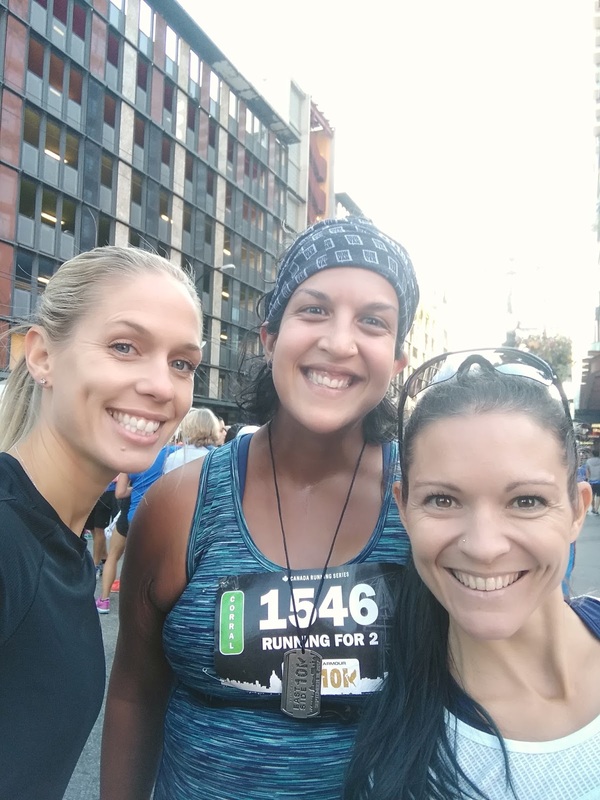 My fear about 10km all at once being a case of overdoing it made me nervous about trying. Silly me, I did just fine! But I am glad I made a plan that aligned with my abilities. I didn't know how it would go as it was a new course this year and I wasn't sure of the elevation profile. Walk the first 2km: to allow the crowd to get ahead and so I don't run too fast getting caught in their momentum. This also allowed me lots of space to move as I didn't want to risk receiving elbows or bumps or not noticing flaws in the road I could trip on. Run the next 3km (until the 5km mark), which I followed pretty well. Little did I know that at around 5km, the course would start to go uphill for a while, so a walk break at this stage was actually ideal! Walk the next 2km (until the 7km mark). I did a bit of a run/walk here because of the hills (walked up, ran down) and actually didn't start running continuously until around the 8km mark. Run from the 7km mark to the finish - as mentioned above, I didn't run continuously until the 8km mark. But close enough :-) I ran straight through to the finish at this stage. If I were to wager a guess, I likely ran about 6km and walked 4km. Not bad! I had a blast out there! It was awesome to be part of a bigger event as a very obviously pregnant woman. I don't think I've ever received so many cheers, high fives, and encouraging words from complete strangers in a race before. Other runners who were miles ahead of me (already on their way back on out-and-back sections when I was still on my way out) took a moment away from their focus to smile at me, wave, and/or say something kind. I also saw many people I know from the running community. It seemed like every 10m, I was waving, fist pumping, or cheering along with someone else. It truly inspired me and pumped me with adrenaline. I felt like Ms Popularity or a rockstar! The best feeling was when I saw the finish line. I honestly said to myself, "already?" as if I expected to be working harder than I was to get there. I kicked it up a notch so I could cross before the race clock could reach 1:30. Since I lined up right in the very back of the pack to start the race, my official chip time was 1:26:36. 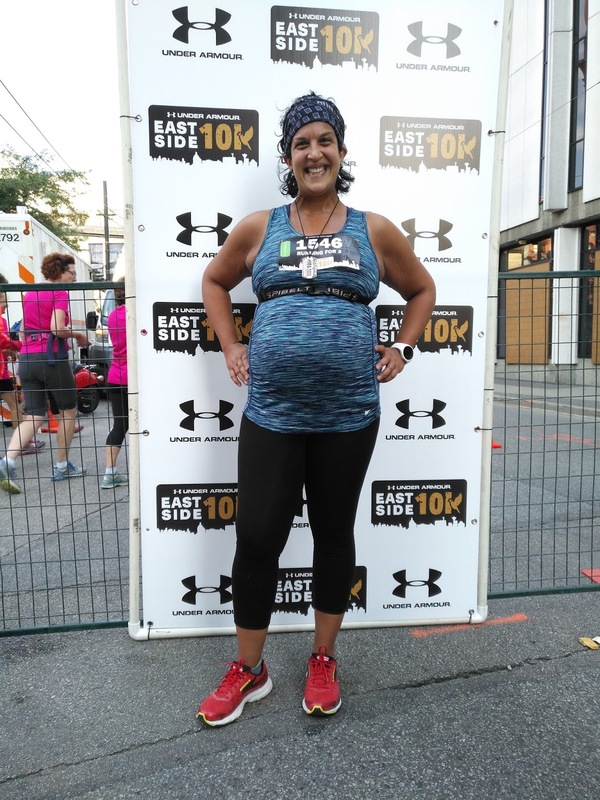 This was officially my slowest 10km event of my life, but at 35 weeks pregnant, I am just amazed I was able to do it. I felt so very empowered! Hours later, the buzz has not worn off. Feeling empowered. A woman can do anything! I enjoyed the post-race festivities a bit, grabbed a bite to eat, and bumped into two athletes I admire -Olympians Natasha Wodak and Lanni Marchant. I didn't want to eat up too much of their time, but they indulged me in a quick chat and Natasha took a selfie of us with my phone. What awesome ladies! 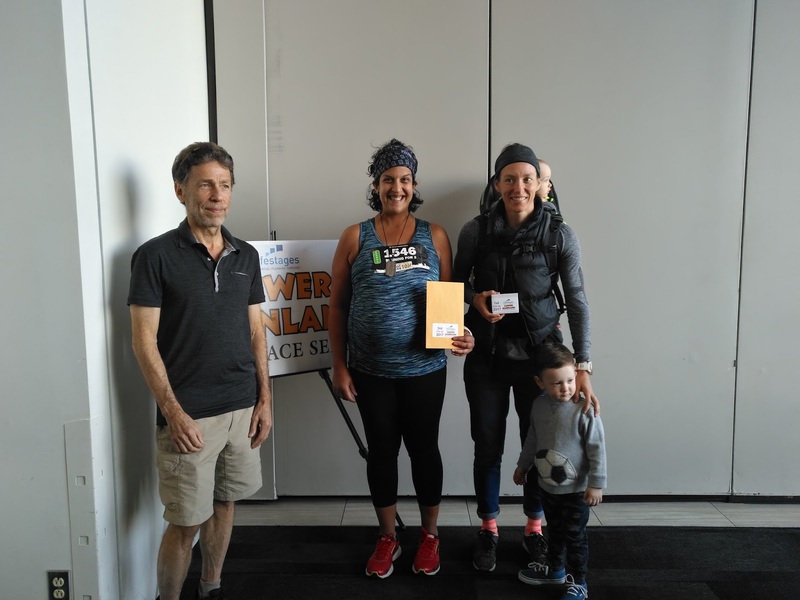 I quickly dropped off some gear off in my car and headed over to Harbour Centre to locate the venue for the Lower Mainland Road Race Series awards. Having officially crossed the finish of this race, I officially qualified for 3rd place in my category. I was very pleased with this outcome! Who would have thought this would be possible in my "condition". Receiving my award along with the 1st place finisher. Seems like the F35-39 category is the "Mom Category"
With my friend Karen, who won 3rd place in her category too. It really was a great day and I want to thank everyone who has offered me encouragement and cheers. I never dreamed I could run this far into pregnancy, especially considering my age and me assuming pregnancy would be harder on me (as I was warned it might be). But I have been motivated to keep going, and keeping going has helped me stay strong and healthy. I am not going to lie though - since returning home, I've had some round ligament and inner thigh soreness. I've been hanging out on my couch much of the day and napped a bit this afternoon too. But I know the feeling will pass. I certainly did overdo it slightly, but not in a way that is leaving me with regret. I'll be fine by tomorrow. And I will enjoy a relaxing / fun day tomorrow, my birthday! Thanks for cheering and reading! You're amazing! Thank-you for sharing this post race report! Im jumping for joy at how awesome you are and how amazing you did out there today! Love & hugs to you today and always.. and HAPPPPY BIRTHDAY! Thank you SOOOO MUCH Monica!